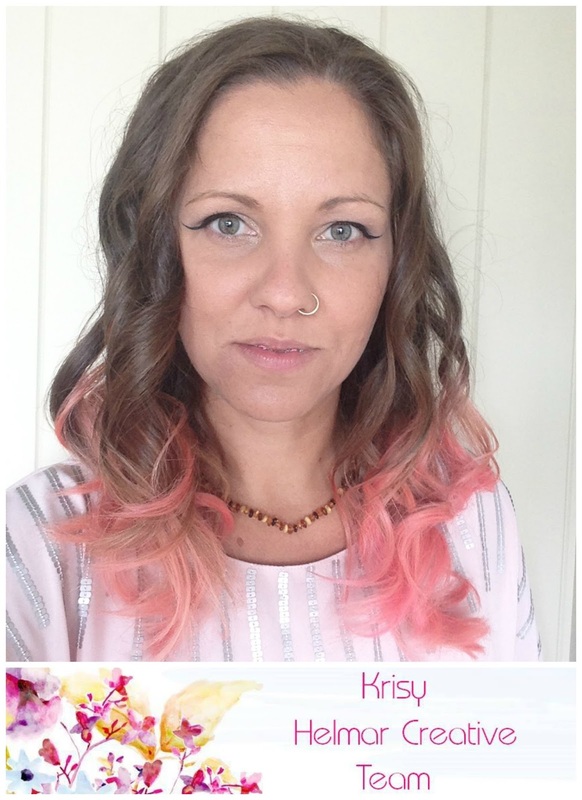 It's Krisy back to share my creation today. This month I was given the theme "Wedding". My first thought was to create a memory box but that involved pulling the shoe box out of the top of the cupboard that currently holds all our wedding bits I saved and that task seemed too hard. Then I remembered I had a some left over material from my dress that would be perfect to create a memory frame. My wedding dress was not your traditional white dress. This project would work with your white fabrics you may just have to use your theme colour behind it to make it show up but it all depends on your fabric. My fabric was Royal Stewart Tartan. I lived in Scotland prior to getting married, my husband had Scottish heritage and I believe this is where my heart belongs. 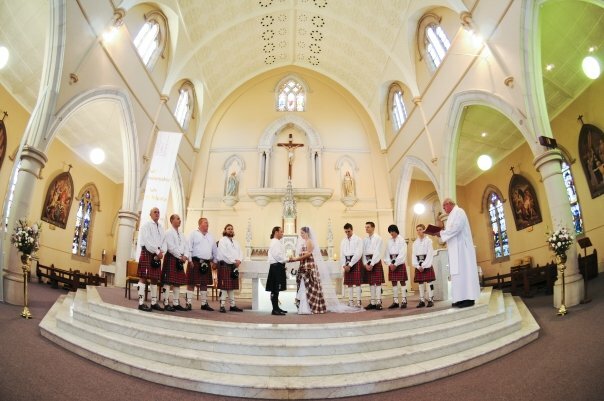 So my husband and I decided we would have a Scottish wedding. Our invitations had a thistle wax seal, my husband and all the groomsmen and bridesmen (I didn't have any maids) all wore kilts and I wore a tartan dress. People had their doubts but it was awesome and everyone comments how unique it was. I decided that I could do a silhouette and this would showcase the actual tartan rather than just a photo of it. So, I chose two photos that I thought had good silhouettes and got on with it. I also used some chipboard numbers and letters to add the date but this is optional. First thing make sure your photo fits in your frame. I thought I would do a head shot to start with but it wasn't distinct enough and it could have been anyone so I decided to go with a full silhouette of my husband and I walking arm in arm. Then using your exacto knife, trim out the image. Make sure you don't cut into the image and keep as true as you can. This does take time. Once your image is cut out, turn it over and trace it in reverse on the reverse of your contrasting cardstock. Mine was black. The reason you do it in reverse is so you don't have to rub out any pencil marks and risk ripping your hard work. Once you have traced your outline onto your cardstock, using your exacto knife cut out the image. This is the hard part done. 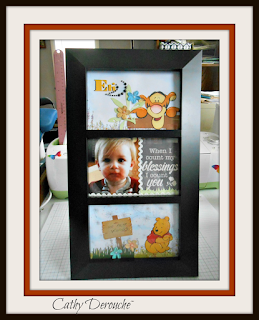 Next pull apart your frame and using the paper inside it as a guide cut a piece of cardstock the same size. I just used black as my tartan is not see through but if you have a sheer fabric or beaded or just white I would go with white or a contrasting colour. This will be your base to adhere your fabric too. Then using your Helmars Acid Free Glue (Acid Free so it won't break down your fabric overtime) glue your material over your backing cardstock. If your fabric is sheer, only put glue around the very outer edges as this will be hidden by the overhang of the frame and any glue that seeps through won't be seen. Then glue your silhoutee over the top of your fabric backed piece. And pop it in your frame. If you want to add your date, do this before putting it in the frame using your Helmars Professional Acid Free Glue. And that is it. A really nice way to capture your memories and display them. Thanks for looking today I hope I have inspired you to record some of your memories. Well, a very happy Bubblewrap Appreciation Day to you all! Yes, there is such an event! When I was given this assignment I was absolutely delighted as I LOVE bubblewrap - not only for the ease it brings when moving house, but the creative way it can be used for mono printing. I have created a number of projects to demonstrate the versatility of bubble wrap that I hope you will enjoy. Bubblewrap - various sizes plus I used the gorgeous heart bubblewrap from Cocoa Vanilla. Special mention to my crafty friend Morgyn who was kind enough to send me large piece of this to use! Grab your gelli plate (this one is an 8x10inch plate), select your paints and get your brayer, paper and supplies ready for action! Put a small amount of paint on your gelli plate. I like to have two (or more) at one time, but this is up to you. Note: my gelli plate has black dots on it from a previous ink stain, however this does not affect the printing or the paint. Using a brayer, lightly spread the paint out until your happy with the coverage. I use a spare piece of paper or my art journal to clean off my brayer with the excess paint. This is great to use for future backgrounds or other projects. Place your cardstock or paper over the plate and press firmly and evenly. This will ensure the best impression is left on your page. Pull the cardstock off slowly and walah! Your first print! Repeat this process trying different colours of paint, different stencils and bubble wrap to make impressions on the gelli plate! I used stamps, washi tape, the heart is from Charms Creations and the 'Love' chipboard is from D-lish Scraps and has been embossed with black embossing powder. For this card I took one of the pieces of printed paper and cut it to fit a little smaller than the A2 sized card. I inked the edges of the card base using Distress inks and adhered the mono printed piece. I coloured this gorgeous digital stamp from Jess Crafts Digitals with distress inks in the colours of Peacock Feathers and Salty Ocean using an ink blending tool. I masked off the bandage element of the image so this would stay white. The panel was adhered to the card using Helmar Professional Acid Free Glue. The whale and sentiment was adhered to the card using Helmar Professional Acid Free Glue and sequins adhered using Helmar Gemstone Glue. Here is an upclose photo of the effect the bubble wrap gives on this background. Here's a close up of the green and yellow canvas - you can really see the lovely pattern that the bubblewrap has left on this print. Thanks so much for joining me on this Bubblewrap Appreciation Day.....I'd love to see how you show your appreciation for this special product. As cited from www.daysoftheyear.com, here is some ideas about how to celebrate on this special occasion! Bubble Wrap appreciation day can best be spent by taking a big old roll of Bubble Wrap and popping every single bubble in the sheet. Share these with your friends and family who need a bit of stress relief, and then share another sheet with them, popping away. One of our favorite ways to destress with Bubble Wrap is to take it and roll it in a tube, grab both ends of it, and twist as hard as we can, causing a torrent of pops to come forth. Maybe you can even spend the rest of the day coming up with new uses for Bubble Wrap yourself! I started out with some basic supplies and some free printables, seen below..
Paints, Neocolor 2 crayon, paint brush and few gel pens not shown. My Deco Art Fluid Acrylics and Neocolor 2 came in handy to paint my wood backing and the corrugated board, After the board was painted, I grabbed the printed daisy circle first and glued it with my Helmar Craft and Hobby PVA to a circle placed on the base of the clock. Then I cut up my corrugated board and painted it all..
Then I lined the flat side of the board against the based of the circle with the exposed daisies. Adhered it with the Super Tac and held it for a few moments in place with a few small brackets. It gives the clock a new shadowbox look I think. I did some gel pen work and made the daisies pop. Instead making it a genuine clock , I decided to prop up a picture of my darling daughter when she was a wee one of about two! I fussy-cut her from an older picture, propped her on a small piece of board with Helmar Super Tac, so she wouldn't flat on the page (and I can slip her out anytime I want! Now to build a face/front. I cut up the painted board and since it was now laying up against the hollow edges of the corrugated board, I decided to use a glue that wasn't so fluid. Helmar 450 Quick Dry!! I also attached a floral flourish and a quote about time and memories, which made me smile. I challenge you to CREATE MOMENTS in TIME, don't forget to bring along some Helmar's Adhesives!! Hi Vicki-Ann here today for Helmar and my project today is a recycled, recovered phone cover. My poor phone cover was falling to bits and because its not the newest of models I was having trouble finding a new one. So I thought I would try and cover it and as you can see below it turned out so cool. I am really happy with the results and it feels lovely to hold. I cut a piece of the canvas pad roughly the same size as my phone cover. I painted it with a layer of black Gesso. I also painted the inside of the phone cover. Then I splodged some colours of Americana paints over the black background of the canvas. I then splattered white Gesso over the top of the canvas and the inside of my phone cover to make it look like stars in a galaxy. I traced around my phone cover and then just cut it out with scissors. Remember to really flatten out when you are tracing the phone cover to allow for the bend. Don't forget to cut out the camera hole.. I put a blob of Helmar Fray Stoppa on my craft mat and ran the edges of the canvas through it, I also used a little on the camera hole edges. I used the Helmar Fabric Glue making sure you go right to the edges and over the middle. I also popped some on the middle bend part of the phone cover just to reinforce that. I used a weight (well its my grandmothers old iron) while it dries to just make sure that it was sitting on that fold part so that it was flat. I sprayed 2 coats of the Helmar Crystal Kote Matte Varnish to seal it and give it some protection against dirt, fading and yellowing. So I now have a phone cover that I am very happy with, that I should have at least till I have to update my phone. I am now thinking what else I can cover with a galaxy painted canvas. Hello! Hope you’re all having a great week. Today I’m sharing a bright, happy layout. I started with the following materials. To begin with I flicked Dylusions inks over a piece of white cardstock. I didn't measure anything, I like a random look! I cut out a kite shape from another piece of white cardstock then a slightly smaller one from red card stock. Then I cut out an even smaller kite shape using the striped paper from Echo Park’s Beautiful Life collection and cut that piece into quarters. I gathered all of the kite shapes and sewed around them with a running stitch. I glued them together using Helmar decoupage glue, one smaller piece on top of the other and used foam dots on the striped paper to give it some dimension. Next, not measuring again; I cut out triangles for the kite’s tail and used the same pattern, white, red then stripes. Gluing them together again with decoupage glue. making it much easier to manipulate into circles on the cardstock. At the end of tail I used Helmar fray stoppa. Next I glued the triangles beside the twine tail. I used Helmar foam glue on the flair button and it worked really well. Lastly I drew a border and added some enamel shapes. Here it is all finished, I love it! Hello friends, Lydia back today to share a very quick creation with you as I get ready to go back to school. And with the topic of school we always think of a lot of handwriting which is the theme of today's post. Although my project doesn't follow the school theme it definately has handwriting. Now I am not one to use my own handwriting on my layouts except for my Project Life spreads that is t record the stories with the photos and so that I do have something documented with my handwriting a teenager to look back on in years to come. Here I use Today's Project Life spread with my very own handwriting. I do find that Project Life spreads are easy and quick to create that can show multiple photos and you can make it personal by adding your own handwriting to tell the stories. Although Project Life is mean't to be simple with just popping your photos and journaling in the pocket pages I am a true embellisher an I love to add lots of things to my spreads and Helmar helps me with that by using their wonderful and trusty 450 Quick Dry Adhesive and Craft Glue. I don't normally say this but I don't really like my handwriting but I know I will be disappointed in years to come if I hadn't have written all those stories in my albums with my own handwriting. Now I hope you feel inspired to document and tell your stories using your own handwriting whether that be in writing letters, writing stories or even documenting your everyday like I have done here in my Project Life spread. Today I have a bit of a different project to share with you. This month I was give the theme "Penguins". Random I know. I initially started off with a random photo of a sign that I took when travelling overseas that said "Beware of Penguins under parked cars" and the road sign image of tyre tracks over a penguin but then I changed my mind. some fabric scraps to create the hat. (Size will depend on your bottle size.) I used appoximately 3 inches x 12 inches. To start, you need to first trim down your bottles. This was made easy for me as one of my bottles had a line about 2 inches from the base. I just traced over it with my marker pen to make it more visible. Then all you need to do is cut along the line with the knife. This part will become the hat. Repeat the process on the second bottle but mark your guideline about 4 and a quarter inches from the base. This bottle becomes the body so you can make it as long or short as you like. Once your body is cut, take it outside and apply a layer of spray paint. Apply thin even coats and allow to dry. While that is drying, work on your hat. Run some Helmars 450 Quick Dry Adhesive around the bottom edge of the "hat" piece and begin to glue your fabric strip in place. Over hang the bottom by about 1-2cm. That way you can wrap the fabric over the cut edge and this will disguise any rough cutting or sharp bits. Once you have glued your fabric in place, snip the overhang at 1-2 cm intervals and fold them back over the inside and glue in place. To finish the top of the hat, run some glue in a strip on the plastic inside the fabric and then stick part of the fabric down, then fold the next piece over and glue in place. Once your first piece is glued down, pinch the fabric about 2 inches along and then glue this into place. They overlap themselves and don't glue flat but this is what adds to the hat shape. I found it easier to cut some triangle bits out of the fabric to reduce the bulk. You will see when you fold the fabric it forms a little triangle flap, I just cut out the bottom layer away and then glue it down. It is a bit fiddly but not difficult. You could also just gather up the ends and glue them into a point too. Make the hat how you want it to look. To finish the hat, I added a strip of ribbon around the base and a pom pom to the top. That is it. All done. Time to finish the body. In the time that I made my hat the body had dried. I got a little trigger happy on one side and the paint was a little thick and ran, so this is the side I decided to cover up with the body. To make the body all you need to do is cut a basic shape of 2 circles and a bit at the bottom. I drew my shape onto scrap paper and then cut it out. I don't know why, I could have just drawn it on the back of the foam. The basic shape is not measured and is very free form. I did trim it a bit later to fit. The size will also depend on your bottle size. Once you are happy with your shape, just cut it out of the white fun foam. At this point you can cut out some flippers from your orange funfoam. Again, this is not very technical. I just sketched 3 bumps at the top and tapered them down into a v shape. Glue your white body to the front of your penguin. Trim as required. then glue on your yellow beak, flippers and googly eyes. Then you are done. For extra detail, I pulled out my chalks and added some shading and details to the penguins face. This is not necessary but looks cute. You could also use some acrylic paint or markers. I hope you enjoyed this little project. It is quick easy and even the kids could do it. They would be a nice alternative to gift bags or every little Christmas decorations. You could even change up the hat and make it his head by painting it black too then add some ear muffs that could double as a handle if you glued them to the body. You just have to use a little imagination. I will be back next month with another project; this one will be wedding inspired. I then decided to add a little ric rac ribbon to frame the picture of Eli and so grabbed my go to Fabric adhesive...Helmar Fabric Glue.. It dries quickly, clearly and strong..
First of all Happy New Year!!! Secondly, Happy Dragon Appreciation Day!! Yea. sounds like a weird holiday I made up? I assure you I didn't! (smile) While most of the nation is off celebrating Martin Luther King Day in the United States. I am getting creative with some pins to exchange in a swap! When I first heard about the planner pin swap, I didn't even have a planner! But hey, how many times have us ladies, bought accessories, well before we had the outfit, hmmm ?!?!? Check out these little cuties!! After gessoing the copier paper I decided I wanted the pins to be a bit for stable. Since I knew I wanted to use the felt. I brushed some Helmar Stiffener on it and let it dry to the touch. Make sure you lay your fabric pieces on some kinda wax paper, to avoid sticking. While that dried, I reinforced my dragons with chip board and a little Super Tac! I hid the chip board with felt and a bit of fabric glue. The Fabric Glues awesome and it got all between the spaces on the chip board pieces. I cut the felt, leaving a small border around the dragons, flipped them over and added even more fabric glue with a paper clip. I was very generous with my supply of fabric glue, so I didn't have to drop anymore. Topped the clip with a small felt heart on back to hide the clip! Here are a few close ups of the clips!! There is nothing better than watching your child graduate. My son had a difficult journey to get to this place but, he did it. We were so proud and knew he would go into the world and find his niche. Before I got started, I grabbed my supplies include papers, tags, flowers, bling and my most important supply - Helmar adhesives! I used 450 Quick Dry, my adhesive runner, Scrap Dots and Gemstone glue. I layered the transparencies and mats under the photos and adhered with my tape runner. I decided to build a cluster of flowers using ScrapDots for dimension. Other embellishments were added using 450 Quick Dry. Adhering the sequins and gems went quickly using the Gemstone Glue! I hid my journaling in the rolled up diploma. Once again, here is my finished layout. Want to make sure you layouts don't fall to pieces? 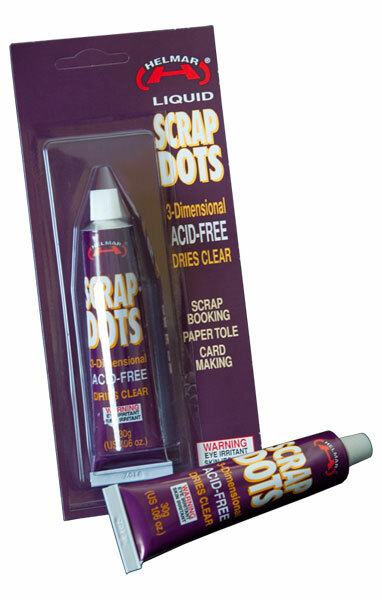 Then be sure to look here at the Helmar website for adhesives for your scrapping and crafting needs.